At its core, this is what local business digital analytics is all about. This is what your clients want to see from you. They want to verify that your expertise is bearing fruit. Can you provide your clients with the data and validation they need, the hard evidence showing that you're producing amazing results? Can you do it in a way they understand? This sounds obvious until you realize many clients aren't getting this kind of validation with their local search campaigns. You don't know how much you know. The vast majority of your clients, especially small and medium-sized organizations, aren't as steeped in the digital world as you are. They're focused on their core business. Most agencies are responsible for knowing digital analytics. They discuss analytics with their clients, using the data to outline their campaign wins and losses. Typically, this creates a few problems in the relationship. 1. Clients don't get it. Rather than break things down into small, bite-size pieces, agencies use the jargon they're familiar with. They overload and overwhelm their clients with their vast reservoirs of knowledge. Clients experience analysis paralysis, and they shut down. 2. Clients are insulted. They're somewhat savvy. They know their way around the digital world, and they're somewhat familiar with local search. They realize, via their limited education, that you're dumbing things down for them. In this scenario, it's easy to assume your (accidental) condescension is intentional and malicious. It seems a tough balancing act, doesn't it? How on earth are you supposed to know whether your clients are knowledgeable and familiar with local search or digital marketing? Are you supposed to know your clients don't understand when they're too proud to tell you? Interview your clients during the initial intake process. You ask subtle questions to evaluate their current knowledge. Simply ask questions about their goals and objectives, the metrics they've used previously with their other campaigns and other campaign or marketing specific details. Then, listen to their response. If your client uses technical or jargon-heavy language to describe their campaigns or data, you know you're dealing with an "in-the-know client." If they use generic language or they don't understand the question, you're dealing with a beginner who will appreciate you dumbing things down. A word of advice? Be discreet. When it comes to data and digital analytics, clients are quickly overwhelmed. You'll want to follow their pace and watch for signs they're glazing over. Why the emphasis on digital analytics? What is it about local search campaigns and projects that requires data analysis and digital analytics? Why is it so important? 1. Internal departments looking to keep/increase their annual budgets. Internal teams are under the gun. They're expected to justify their value. If they're successful, their budgets are maintained. If they fail, budget cuts and layoffs often follow. 2. External competitors looking for a bigger piece of the pie. It's common for your clients to work with a variety of external service providers. It's also common that there's a bit of overlap. Your agency and your client's PR firm both offer local search services. Both are looking to keep/increase the revenue received from their clients. 3. Individuals looking for a career-defining moment. Employees are continually jockeying for position. If they can achieve better results with less time or money, your agency will be replaced. These employees hope to receive a promotion, raise or reward for their efforts. The most important reason for attribution and data analysis? If your clients give you a dollar, they want three dollars in return. What's more, they want you to prove that their stellar returns came from your hard work. While nothing, and I mean nothing, can beat on the job experience, you need the right training. A traditional 4 year college moves to slow to keep up with evolving technologies and solutions. Like most digital related careers, a self-driven motivation for continued education is essential to success in any digital field. If you have the right foundation, you're able to answer the questions your clients ask with cold, hard data. Learning digital analytics requires two types of knowledge. 1. Strategic expertise - knowledge of the ways the data can be measured, measurement terminology, and strategies for stitching together the story the data is telling, and an ability to ask the right questions and an understanding of what data you need to find. 2. Technical expertise - the ability to implement (or understand the implementation) of data capturing techniques as well as technical knowledge of how to practically get the data you require to answer your higher level questions. What if you don't know much about digital analytics? Where can you go to get the Google Analytics, Tag Manager and Data Studio training you need? In addition to the courses below, we curated a nice smattering of blogs, resources and people to follow to stay up to date in this 2018 digital analytics blog post. Conversion XL offers a digital analytics mini degree program via their CXL Institute. Conversion XL has a solid reputation. This program promises advanced level skills and digital analytics. Large Fortune 500 companies (e.g. IKEA, Home Depot, Hilton, Gartner, Symantec, Progressive, HP and yes Google) rely on the CXL Institute to train their employees. If you're skeptical about the course, you can always schedule a demo, enabling you to try before you buy. Their course requires 15 to 20 hours per week. It covers three cumulative tracks and provides students with 130+ hours of videos and study materials. It's a comprehensive course that takes beginners and turns them into highly trained data analysts. The legendary Avinash Kaushik, Google digital marketing evangelist, co-founder of Market Motive and author of the book Web analytics 2.0, offers a comprehensive course on advanced web analytics. This course is part of their larger Masters in digital marketing course. It's an unbelievably deep dive into web analytics. This massive course has 15 modules or projects covering the fundamentals of digital analytics, building a business case for analytics, research, reports, privacy and ethics, data analysis fundamentals, conversions on boarding and more. This course is massive. Another outstanding detail? This is an OMCP course. It's not just another meaningless certification. It's backed by "a community of practice that includes individual professionals, partners in the industry, and academic partners." Digital marketer offers a comprehensive, seven-hour course, showing marketers and analysts how to curate, read and apply data to grow your client's business. The course comes with seven modules covering - metric categories, data lenses, converting raw numbers into meaningful actions, data storytelling, traffic sources and more. This course is comprehensive but it approaches analytics from a non-traditional angle. This course focuses on the top, middle and bottom of the marketing funnel, aligning analysis around these core details. Covers: digital analytics from A-Z, focusing on the marketing funnel as a whole. You learn about analytics as it relates to product, service and hybrid businesses. You'll also learn how to convert data into stories and meaningful actions. This covers a variety of tools including Google Analytics, tag manager, data studio, and more. The name is a little strange, but don't let that discourage you. Jeff Sauer, founder of Jeffalytics, owner of Three Deep Marketing and a leading global authority on Google Analytics created wildly popular analytics course. More than 7,588+ students have purchased this course. This course promises to take you from beginner to professional in 30 days or less. Analytics Academy teaches marketers about Google's measurement tools specifically so they can grow their business through intelligent data collection and analysis. These courses come in several flavors. Google Analytics for Beginners: Teaches marketers the basic features of Google Analytics including how to create an account, implement tracking code, analyze basic reports, and set up goals and campaign tracking. Advanced Google Analytics: Covers advanced Google Analytics features including data collection, processing and configuration, and more complex analysis and marketing tools. Google Analytics for Power Users: Learn and practice actionable analyses to track business performance and identify areas for business improvement. Getting Started With Google Analytics 360: Covers powerful Google Analytics 360 features that are not available in their standard product. Shows marketers how to gain insight into how they can benefit from integrations with BigQuery, Google Marketing Platform products, and Google Ad Manager. Introduction to Data Studio: An introduction to Data Studio helps marketers learn and practice beginner steps in connecting your data and building Data Studio reports. Google also provides helpful resources and mini-courses on YouTube. What's the best way to discuss plans, goals, and metrics? Every client comes to you with a specific set of high-level objectives in mind. These objectives determine the success (or failure) of your campaign in their mind. Here's the problem. Your clients won't volunteer these details. If you'd like to know what their core business objectives are you'll need to ask. While quantitative objectives are more measurable, it's common for these business objectives to be more qualitative in nature. Have your clients identify one to three essential business objectives. One goal would be ideal as you're able to focus your attention completely on one specific objective. Next, break these objectives down. Let's say you wanted to break your client's generic or qualitative core objectives (i.e. boost local search referrals) down into a set of specific and measurable goals. What would those goals be? Increase aggregate review listings in search results to three in the next 8 to 12 mo. Build your first 100 backlinks (via a mix of media mentions, .edu, outreach, apps, quizzes, etc.) to client websites, social media and review profiles, etc. Can you see the specificity? That's what we're going for here. The more specific our goals the easier it is for us to track these metrics with digital analytics. Which metrics we should we be tracking anyway? Here's a starter set of metrics you can track. These metrics can be tracked with unique links using UTM parameters, vanity phone numbers, and specific landing pages. Using secondary and tertiary tools like Google Search Console and Google URL Builder, you can integrate local, social and review management tools with your analytics. At some point, you're going to need access to your client's Google analytics account. If it's a new account you'll need to create one and then set it up properly. Paul Boyce over at Popcorn Metrics feels it's best to give/create each client their own account. Here's the strategy he recommends for agencies (which I agree with). 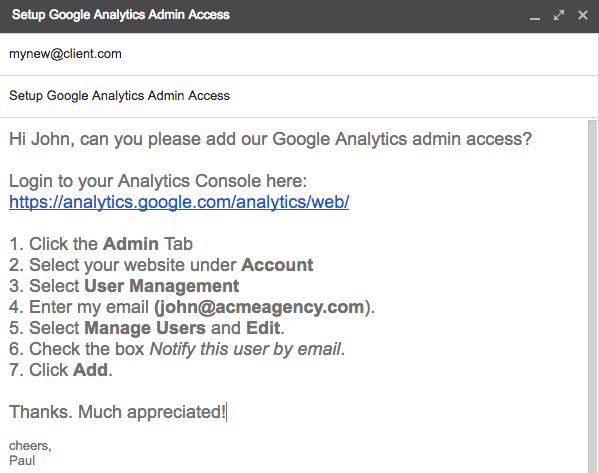 "Your Client should then add you to their Google Analytics (GA) account as an Administrator. In the unlikely event that your client doesn't yet have Analytics set up, just ask your client to sign-up for a Google Analytics account, and then get them to add you. Later, if they choose to switch to a different agency, this will allow your client to remove your access. It is better they have control." Here's the template he shared if you can't see the image above for some reason. Body: Hi [Name], can you please add our Google analytics admin access? You can also follow the prompts listed here. Once you're in, you need to set your client's analytics account up properly. Here's a helpful video (and course) from Google showing you how to do that. It's frontloaded work but it's simple and straightforward. This is what local business digital analytics is all about. Your clients want to verify that your expertise is bearing fruit. You can provide your clients with hard evidence, the data and validation they need. You can tie their business objectives to quantitative marketing goals. You know how to help your clients. You know how to present the data in tiny, bite-sized pieces. You have the tactics you need to avoid accidental condescension. Many clients aren't getting this kind of validation with their local search campaigns. This isn't due to agency neglect, it's due to a misunderstanding. Digital analytics is a game changer. With the right training, tactics and support you'll have everything you need to show your clients the money.